These words must repeat themselves over and over, all around the world, day after day, at least everywhere where families drive cars. If the girls decided our plans, we would watch Curious George all day and night. When we get to where we are going and I catch them skipping down the trail, I know we have it made. After dinner the other night, Blue Eyes, Sparkles, Buttercup and I headed out for a night time hike on Lady Bird Lake. 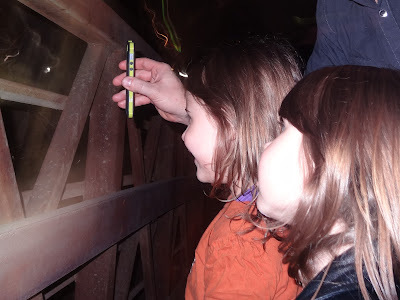 Night time hikes for little kids aren’t a super common after-dinner activity, but they shouldn’t be ruled out. There were lots of animal and insect sounds. There is some light, lots of shadows and a spooky vibe. Catching spiders in the glow of an iPhone is way cooler at night, than the same spider in the sun during the day. For a night time hike, I go to Lady Bird Lake, on the north side, near Austin High School, because the trails are wide and there is some light from the moon and the city. It requires one adult per kid. Everyone needs to be extra aware of others on the trail and of the nearby water. Our max time for a night time hike is about thirty minutes. But with a little extra care, it can be a sweet time, with lots of skipping and spider watching, followed by heavy heads resting on your shoulders, as you carry them back to the car to head home. See AustinKidsHike.com for kid-friendly hikes within city limits and kid hiking tips. I love play dates with grown ups. We are very lucky to have grown ups who love the girls and love to hang out. This picture is from a play date at Lady Bird Lake with a teacher from the girls’ last day care. Sparkles asks about play dates with this teacher just as often as friends her own age. Play dates with grown ups have several advantages. – Grown ups are better at sharing. – Grown ups have fewer accidents. – The kids and I take turns with the grown ups, so I get some adult time too. I don’t mean to talk bad about the kid play dates that we also love very much, I’m just saying that today I’m especially appreciative of play dates with grown ups. You know who you are and I love you.